Well, if you thought you were cutting your mangoes right all this life you couldn't be more wrong. Mangoes, the most delicious part of summer is what we are all waiting for since new year. This healthy fruit low in calories and high in fibre. It is also a great source of vitamins A and C and contains folate, B6, iron, zinc and vitamin E. Mangoes are also a rich source of antioxidants that make it one of the best fruits to consume. While the health benefits of this delicious treat are innumerable, the right way to consume fruit is kind of tricky. Since it has a sticky, fibrous seed in the middle also called the gutli (which too btw has lots of health benefits) removing the pulp from the fruit is no less than a task. The Internet has a lot of simple hacks to eat mangoes the right way that will make you think why didn't you know this before? Fruit Seeds Health Benefits: Mango, Jamun, Jackfruit+ 3 Other Kernels That Are Super Nutritional! The chequered board style: This simple method includes cutting the mango into three pieces vertically. After that, you can take the two pulpy pieces on the side and cut the pulp like a chequered board now twist the piece inward and relish the pieces. The glass method: Cut the mango vertically in a similar fashion and take the pulpy side on your palm. Now take a glass with a sharp edge and slide the mango piece on the glass edge in a way that the edge cuts the pulp and the skin apart. Scoop and eat: This probably is the easiest way to eat mangoes. While you cut your mangoes vertically into three parts, you can take the pulpy part and using a spoon, scoop out the pulp like an ice-cream and relish. 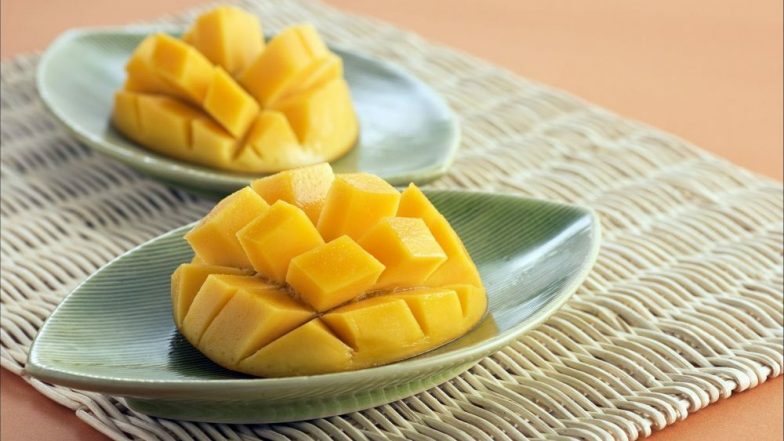 Whatever way you opt for do eat mangoes for sure as they are currently in season. Eating seasonal fruits have their own set of health benefits.